I started playing banjo at the end of my last year in high school - and that was more years ago than I care to think about right now. 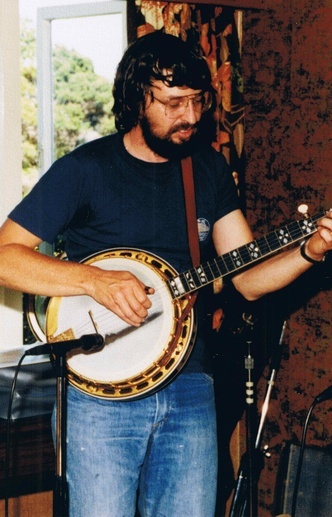 Here in in New Zealand it was pretty tough back then for a beginner to find any sort of material to learn from, although the odd bluegrass album did sneak its way past the NZ Music Police and find its way into our retail stores. 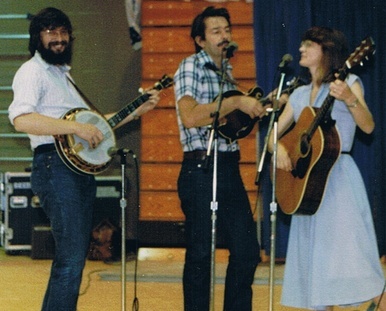 For years I was under the impression that the only people (other than The Hamilton Country Bluegrass Band) who played bluegrass music were the Dillards and Flatt & Scruggs - both groups having featured on TV shows here. Eventually I met a few other pickers and was able to get a better understanding of the music and where it came from - as well as getting hold of some more material to listen to. Through this time I played in various musical groups, notably the Auckland based folk band El M'fud and then later with Wellington based Urban Renewal. In the 1980's I spent 6 years living in Arlington, Va and was able to get some first hand experience of the music from some of the best in the business. I was a frequent visitor to the Birchmere, enjoying the regular weekly performances by The Seldom Scene and getting to see and hear all the top rated bluegrass groups of the time. Returning to New Zealand saw the formation of the Terraplanes - we played around Auckland for about 5 years before calling it quits in the early '90s. I took a break from playing music for a period of nearly 10 years from 1992, although there was the odd flurry of activity for a couple of years in the middle of that period. In 2002 I rediscovered my banjo, which had been buried in the back of a closet, and set about re-learning to pick. It took quite a few hours of hard practice to restore any sort of muscle memory, but I persevered and eventually found my self venturing out to music festivals once again. At one of these festivals I met up with my old friend Alec Healy and had a really good session with him on bass, Dave Warren and Rich Leschen on guitars, and Micheal Young on mandolin. That was the beginning of Wires & Wood. I am still playing banjo with Wires & Wood. I've also been known to branch out into the odd bit of Old Time Country with Beverley & Alan Young as well as playing backing banjo for my good friend Martha Louise. I also get together from time to time with Paul Trenwith and Keith MacMillan, performing under the name of Out To Lunch. Over the year from July 2010 to June 2011 Beverley and the Clench Mountain Boys have recorded a new album. It will be available real soon now. In recent times I am also playing with Peter Parnham and Neil Finlay in our bluegrasscountryswing group, The Remarkables.